Grass and brush burn south of US Highway 40 during a wildfire near Lay Creek. 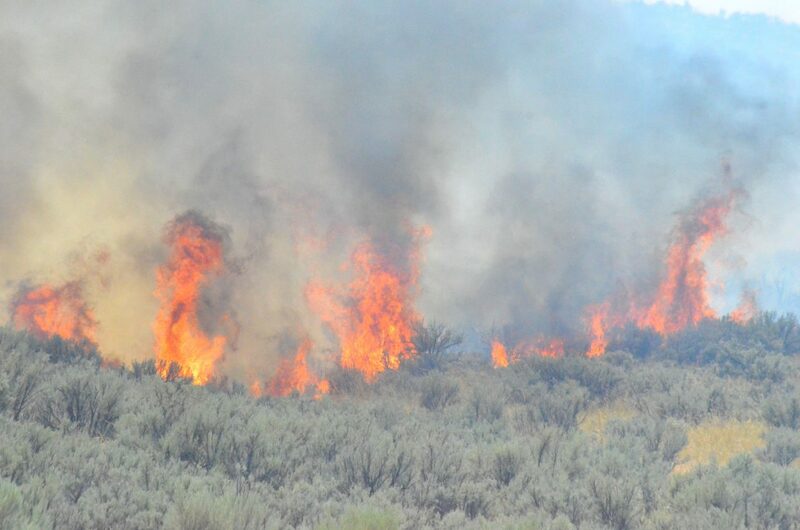 Firefighters were called to a wildfire Tuesday afternoon at mile marker 76 of US Highway 40 near Lay in Moffat County. The blaze, near Lay Creek, was first reported at 12:30 p.m. and had burned five acres of land south of the highway as of 2 p.m.
Traffic along the roadway was slowed down at mile marker 76 as workers prepped equipment. Among the agencies responding to the incident were Craig Fire/Rescue, Moffat County Sheriff’s Office, Colorado State Patrol, Bureau of Land Management and Memorial Regional Health. A single engine air tanker was utilized to dump flame retardant on the fire. Authorities confirmed after 3 p.m. the fire was extinguished.